As a result of European Union Directives, together with national legislation, the fibre content of textile articles must be indicated at the point of sale using generic names. Generic names are distinct from trademarks which are used by individual producers to identify and market their own products. WHAT ARE GENERIC FIBRE NAMES? Producers are responsible for the application to the European authorities for a new generic fibre name. BISFA can support the application. 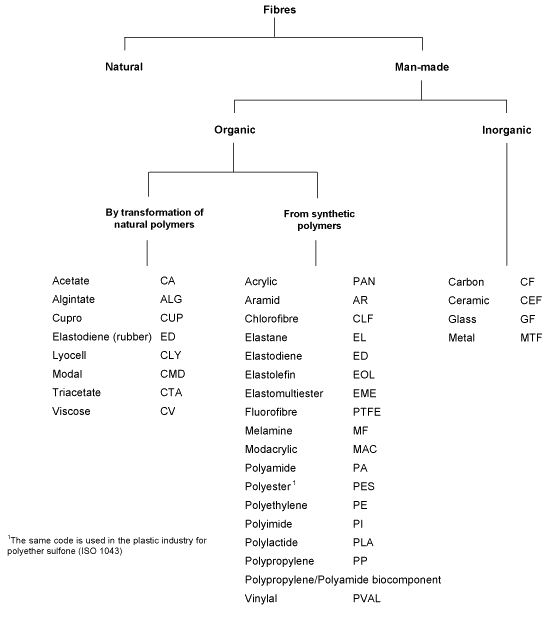 A generic name can cover a range of products but must refer to the chemistry, the technologies used and the fibre properties. Following publication in the Official Journal, the name is included in the BISFA generic classification of fibres. This is published in the BISFA booklet entitled “Terminology of Man-made Fibres”. New generic fibre names are restricted to products which are manufactured commercially. New fibres at the development stage are excluded. At the request of European Commission (in particular Directorate General Enterprise) BISFA provides its support and expertise within its guidelines for the introduction of new generic fibre names. BISFA or non-BISFA members can apply for a new generic fibre name to the European Commission, irrespective of the country of manufacture. To obtain the support of BISFA the application must be addressed to the BISFA secretariat which will submit the application to the Standards for Fibres and Textiles Committee. This committee can establish a working group with the applicant to prepare a proposal. Any decision on whether to approve a new generic name is taken according to the principles noted above. If the Standards for Fibres and Textiles Committee approves, the application is submitted to the Policy Committee for approval. Final approval will be given at the BISFA Annual General Meeting. The BISFA booklet “Terminology of Man-made Fibres” will be subsequently amended. BISFA can respond to applications lodged at the Federal Trade Commission in the United States of America through the American Fibres Manufacturers Association (AFMA) or through the European Commission. Following acceptance, the new generic name can be introduced into ISO Standard 2076 (generic fibre names). While a new generic fibre name is being considered for approval, the fibre may be marketed. Principles to be considered regarding the application of new generic fibre name.